The Austrian Theory of Firm Seminar lead by the economist and professor Peter Klein is a group discussion of the benefits and costs of firms, their role in markets and the perspectives of different authors about this type of organization in free markets. In this last session, professor Klein analyzes the article “Entrepreneurship and the Economic Theory of the Firm: Any Gains from Trade?” that he himself wrote with the economist Nicolai J. Foss. He discusses the divorce between the fields of the firms and entrepreneurs by considering Joseph Schumpeter and Israel Kirzner’s work. Klein later discusses some Austrian literature on business strategy and management from authors like Robert Jacobson and John Matthews. He also presents a last application of the Theory of the Firm related to political economy, government intervention and big companies. 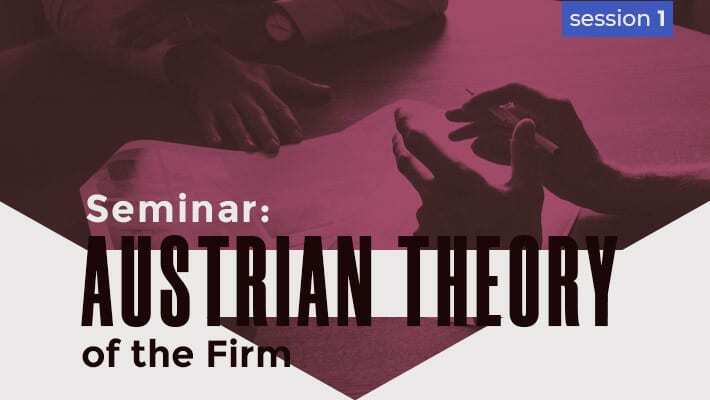 Don’t miss the whole collection The Austrian Theory of Firm Seminar!